Social buzz resonates almost everywhere. It clearly becomes an integral part of our private lives. What’s more, it is now part of our business lives too. SFDC’s Social Enterprise is a great example of implementing “enterprise social network” into corporate environment—generally known as Chatter. Microsoft Dynamics CRM entered the social doors in 2011 by releasing Activity Feeds —a “corporate Facebook”. While Chatter is available on the most important mobile platforms for quite some time, the Dynamics CRM’s Activity Feeds are only available for Windows Phones. Are you also thinking about…? Yes, you’re right! We in Resco have decided to bring Activity Feeds to the Mobile CRM App—the natural and only choice of tens of thousands of customers using CRM out of their office. 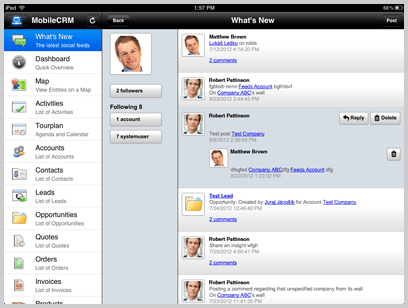 Today, we announce a new version of Resco Mobile CRM Collaboration Update, which is scheduled for October 2nd, 2012. The new release will enable getting real time notifications and updates on opportunities, leads, accounts etc., sharing the essential information with colleagues and also many other features. We believe the Collaboration Update will be a small revolution in the Microsoft Dynamics CRM eco-system. Or perhaps a little bigger.